The wife of a missing man, feared dead, is raising awareness of the heartbreaking symptoms of Dementia with Lewy Bodies. Christchurch in Dorset and Worthing in West Sussex have been named dementia hotspots by Alzheimer's Research UK. He was a leading judge who had devoted his professional life to the family courts. But when Sir Nicholas Wall was diagnosed with dementia, he feared for the future. Today, an inquest heard how he 71-year old took his own life at the nursing home in Sevenoaks where he had been staying, once his health declined. He had left letters to his wife, saying he had lost the will to live. Tom Savvides reports from the Coroner's Court in Maidstone. His report contains footage from Gresham College. With an ageing population, many families in our region are experiencing what it's like to have a loved one - with dementia. And that's why, this evening, ITV's Emmerdale has a special episode. Viewers have watched the gradual demise of Ashley Thomas for several weeks and, tonight, the story shows how difficult life can be for the person living with the condition. The interviewees are Iain MacLeod, Series producer; Charlotte Bellamy, who plays 'Laurel Potts'; and John Middleton, who plays Ashley Thomas. There are more than 800,000 people in the UK living with dementia and that number is expected to rise. Now, families, charities and businesses in Kent are being recognised for the help and support they offer to those who have the condition. An awards ceremony, hosted by former newsreader Angela Rippon, has been taking place in Sittingbourne. Tom Savvides has been to meet one family who've been shortlisted. Dementia can be a devastating illness, and one of its most common effects of course is memory loss. Often, sufferers recall the distant past more clearly than recent events. 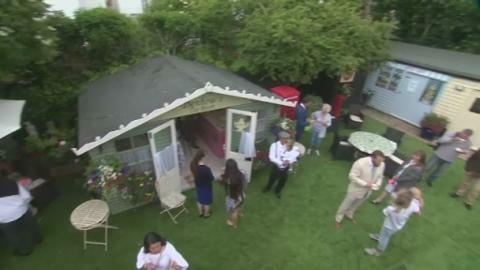 A care home in Sussex has created a special garden recreating the post-war era, to keep alive the memories of its dementia patients. Malcolm Shaw reports. Dementia can be a devastating illness, and one of its most common effects is memory loss. Often, sufferers recall the distant past more clearly than recent events. Now, a care home in Sussex has created a special garden recreating the post-war era, to keep alive the memories of its dementia patients. Malcolm Shaw spoke to Nosi Ncube, manager of Fairdene Lodge in Hove, and Warren Benbow, whose family made the project possible. Dementia is a cruel illness, robbing families of their loved ones - or the person they once knew. Caring for a relative with the illness is physically and mentally draining, which is why a new trial in Oxford is aimed at helping carers. In Berkshire the figure is 72,000. And in Hampshire there are approximately 131,000 friends or relatives looking after people with dementia. Cary Johnston reports on the pioneering "Caring for Me and You" trial. One in 14 people over 65 - and one in six over 80 - have dementia, but new research in our region is hoping to combat these devastating illnesses. Some of this work is being done at the University of Sussex where a build-up of proteins on the brain is being studied. And in this Dementia Awareness Week members of the public have been invited to see their work close up. Andy Dickenson reports. He speaks to Andy and Janet Gumbrill, Dr Karen Marshall and Prof Louise Serpell.